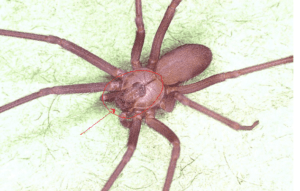 Delivering GUARANTEED Spider Control in Greater Phoenix – Mesa & Tucson AZ! 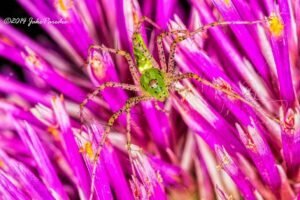 Effective Spider Pest Control in Mesa – Phoenix & Tucson areas starts with a professional “clean out” of your home & yard. Delivering targeted control of spiders and their prey (other bugs) plus the places they live, breed, & feed! Responsible Pest Control Pro’s treat under eves and SWEEP DOWN spider webs to effectively eliminate spiders! 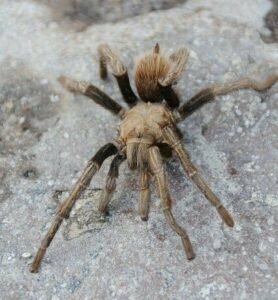 Main spiders in our area are Wolf Spiders & Black Widow Spiders. Wolf spiders are big and scary but not a medical threat, however Black Widow bites are 15x’s MORE venomous than a Rattlesnake! 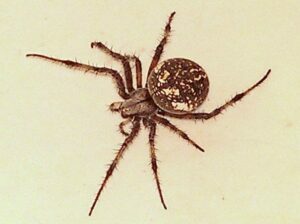 The only Spiders with serious medical concern in our area are Black Widows & Brown Recluse. When the weather cools during fall and winter months, Wolf spiders come in looking for a warm place. They are often seen: running along walls, corners, by doors, windows, house plants, and in garages. 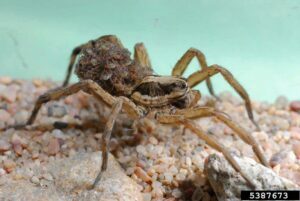 As big and scary as they are, Wolf spiders run away when disturbed. Although the “squish it” method is fatal to all spiders, it can be too much for many people. You can also help prevent spiders from coming in your home by sealing up points of entry. Spiders can get through VERY small holes, so calking around windows and doors is a must. You may also need to replace or add a door sweep because this is an area where there is usually holes for insect entry. Our professional products are very effective against all spiders including Wolf Spiders and Black Widows. The BEST way to kill spiders is to use a regular pest control program that does all the dirty work for you, and prevents spider problems in the future. If you ever get a spider or pest invasion between regular services, just give us a jingle and consider it done! We’ll get you on the schedule for a service right away – free of charge! Providing EFFECTIVE Pest Control that’s FRIENDLY to Family & Pets! Responsible Pest Control technicians make your family & pets safety top priority when choosing products & applications. Providing SUPERIOR service at AFFORDABLE prices by using premium products, RESPONSIBLE applications, & continuing EDUCATION. We answer your questions, give courtesy CALLS, wear BOOTIES inside, SWEEP Spider WEBS, do FREE Termite Inspections, and pay attention to DETAILS! Join 1,000′s of Happy Customers living PEST FREE in Arizona! 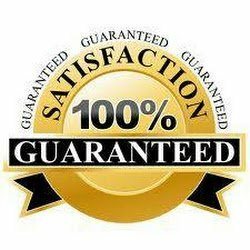 – GUARANTEED! Delivering EFFECTIVE Spider Pest Control in Chandler, Mesa, Phoenix, Glendale, Scottsdale, Gilbert, Queen Creek, Maricopa, & Greater Phoenix & Tucson AZ areas.